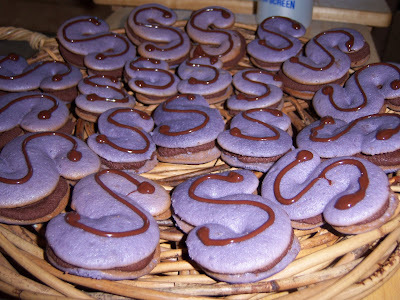 The Whoopie Pie trend is just taking off - and already I'm declaring a new one: Specialty-Shaped Whoopies in Colors Not Appearing in Nature. My dear friend Sandy was having a birthday get-together this weekend, and I STILL had some buttermilk in the fridge so you know what that means: Whoopie Pies! 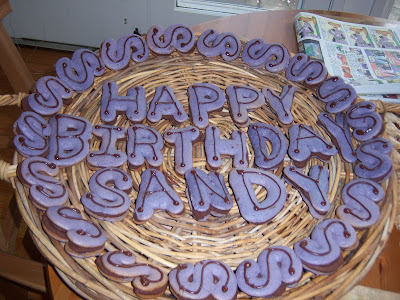 I was so happy with the cheery pink of my Valentine's Day Whoopie Hearts, that I thought I'd tint this batch Sandy's favorite color: purple. I don't think I was entirely successful. 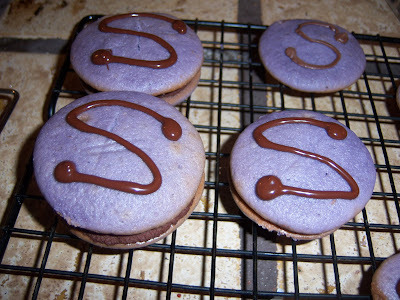 Maybe I needed more food coloring, or maybe baked goods just aren't supposed to be purple. 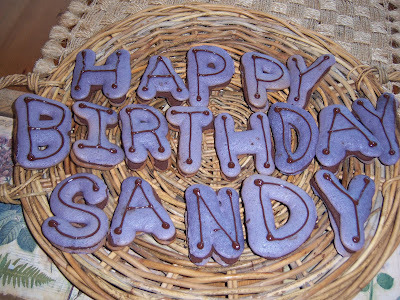 Then I really went for broke and spelled out "Happy Birthday Sandy"
Cute, no? For the final presentation I put the "S" pies around the greeting as a border - very festive! I thought I was late to the Whoopie Pie party - but none of the other guests had ever had or heard of them, so I was happy to give them a sweet education. If you wanted to make a more precise shape - print out a template on paper and slip it under parchment paper and use it as a guide. Martha Stewart wasn't going to be at the party judging my efforts, so I just free-styled it. I used the Light Whipped Ganache from Rose Levy Berenbaum's The Cake Bible as filling. It's tasty and easy, but I think I like Nick Malgieri's version from Perfect Cakes that calls for butter and corn syrup in addition to the cream and chocolate a little better. Rose's is a little dryer and the cookies don't stick as well.